Babcock & Wilcox Boilers | Fischer Equipment Ltd.
B&W’s water-tube package boilers have an established reputation for reliability and proven performance in a variety of industries. A full complement of auxiliary components are available depending upon your application. In addition, we offer comprehensive support services after the sale. Available in a wide range of capacities, our package boilers are continually enhanced by incorporating the latest technological advancements. Most FM units are a D-type boiler design and have the furnace on one side and boiler bank on the other, separated by a baffle wall. 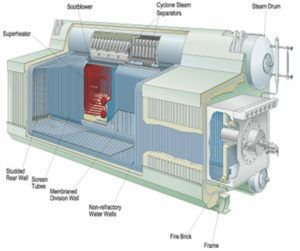 In a D-type unit, firing is parallel to the drums toward the rear wall where the gas turns 180 degrees and flows frontward to the gas outlet. In addition to burning oil and natural gas, these units can burn a variety of gaseous and liquid fuels such as landfill gas, refinery gas and various waste liquid fuels. 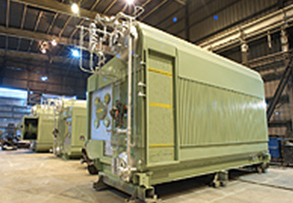 Shop-assembled (package), two drum, bottom supported, D-type boiler, which can be shipped by rail, truck or barge; gas-tight furnace, uses membrane construction for pressure firing; drainable superheater. Capacity: 10,000 to 260,000 lb/h (1.3 to 32.8 kg/s). Steam pressure: To 1250 psig (8.62 MPa) design. Steam temperature: To 800F (427C) on oil, to 850F (454C) on natural gas. Fuels: Oil (#2 through #6), natural gas, and other gaseous and liquid fuels.